Successfully Added Car 5 Inch Touchscreen Multimedia Player with Bluetooth (1-DIN) to your Shopping Cart. 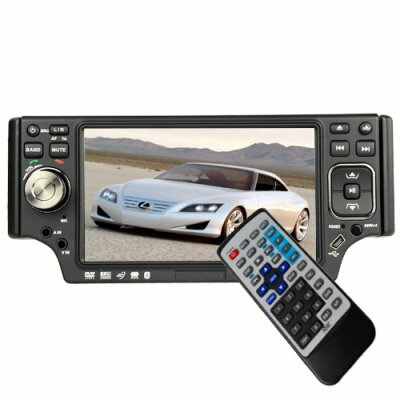 Single DIN (50mm tall) car DVD player, modern handsfree Bluetooth and entertainment center with extra large detachable faceplate with 5 inch widescreen (16:9) LCD. The heart of this new 1-DIN sized vehicle multimedia system is the front panel with comprehensive button selection along with the responsive 5" touch screen interface allowing easy access to all the media and Bluetooth handsfree functions. This model will play all of your favorite disc and digital media formats and also includes a built-in TV tuner plus frontside mini-USB and SD card ports. There are a lot of car DVD / multi media players in the market these days, right? So what makes this model any different? Aside from its great touchscreen and button interface, this model has sound quality and sound output options that are a step above the rest. With 4 pre-outs, a sub- out and even an SPDIF OUT connection, this model was designed to be a real sound superstar, but at a budget friendly price! Combining an excellent design and the latest in entertainment technology this new car multimedia center is a great upgrade for any vehicle and lifestyle (salesman or soccer mom). A great wholesale price makes this unit perfect for the resale market, VAR and OEM market, or simple personal/company use. As always, it is only available from your source for wholesale direct from China electronic products, Chinavasion. Car touchscreen DVD + multimedia player with beautiful 5 inch display. Standard single DIN size, 50mm tall. Detachable faceplate and carrying case provide for added security and convenience. Can play MP3 and WMA audio files and MPEG4 video files from disc (cd-r), USB, SD card, or even files from your portable media players. Note: Antenna's are not included. AM/FM Radio and Analog TV should work off your cars own antenna.